Birthday Burgers and Friendly service!! Situated along the side of the beach at Hill Head, The Osborne View is a popular drinking hole for beach combers in the summer months. However, it is also quite well known for its food, so as a birthday choice, Clair picked this setting for Februarys visit. The decor is clean and light, and has just been repainted in some areas (you could smell the paint in the ladies toilet!!) The menu is varied and well priced, allowing for the rules of Grub gang to be obeyed! Clair, Dean and Mike all chose a burger for the main course, with Gemma opting for a tuna steak. We were so impressed with the starters, we were hoping the mains would follow suit. Unfortunately, for the ladies this was not to be. Gemma found her vegetables too mushy for her taste and Clair experienced some very salty bacon in her chicken burger. Of course, this was purely our own taste opinion and some may enjoy these dishes! The ladies also felt a little dissappointed with the french fries...with Gemma suggesting that handmade chips may be a little better to steer away from the "fast food" feel. The desserts were simply delicious, although only the ladies dabbled in some ice cream! However, Dean tried some and the contented "mmmmmmm"'s coming from his direction proved the ice cream was indeed a winner!! It is quite nice with our new members now, that when we revisit places for Birthdays, there are people who havent visited the place before! Today, we had a special guest to celebrate Peter's Birthday in the form of our friend Emma Butler, who had her first GrubGang experience! Since we last visited the restaurant/pub, they have introduced the sharers menu at the Osborne View. This idea allows for people using the GrubGang rules to get their meals at a great price, with the promise of 3 courses for £20, sharing a starter and dessert and enjoying an individual main course. The idea of this was very appealing, at least for Dean, Clair, Emma and Peter, but all of them soon realised that the starter size was the same as a normal non-sharing starter! Emma and Peter shared the lamb kofta and added the extra starter of chicken wings (still within the budget!) which were well recieved. Clair and Dean shared the lamb kofta (well, Dean ate all of it we should say! ), whilst Clair ordered the extra starter of Prawn toast, which wasnt what she was expecting! Prawn toast usually implies the chinese delicasy which Clair loves, but this was like a prawn cocktail on toast, which although not what she thought it was, was tasty all the same! Dave and Gemma opted to have individual starters, Dave having the bubble and squeak cake with a fried egg and hollandaise sauce. This, was a weird combination, so he thought he would give it a go. The portion wasn't very big, and the sauce was excessive, spoiling it a little he felt - less is more in this case! Gemma had the Kofta too, which she felt was faultless! So, onto the mains. Starting with Gemma and her Fish and Chip platter! A chip shop classics dish : scampi, fishcake and a piece of battered cod with mushy peas chips and curry sauce. It was nice enough but Gemma found just too greasy for her taste, so could not finish the whole plate - which was a mammoth portion size and definitely one for the hungrier visitor! Clair ordered the sausages, but was let down when they had run out and instead went for the lasagne, which was nice but not anything out of this world. Emma tried the Scampi, chips and peas which she felt was not too greasy and delicious. Peter shared this sentiment with the same dish! Dean, ever hungry, also went for the scampi but felt it was purely good honest pub food, rather than anything special. Dave was joining Clair by ordering beef lasagne but with a side of chilli cheese chips. This, unfortunately was not what he expected. The lasagne was bland, and meagre in his opinion. The garlic bread was the most enjoyable part of the dish as chilli cheese chips that he was looking forward to turned out to be tiny in portion, with not a lot of cheese, or chilli. The chilli was also extrememly hot, so one thing to watch there! The desserts came next......Clair and Dean shared the cheese board which had some lovely tasty cheeses on and was very good value! Dave loved his trio of ice cream. He had honeycomb, belgian choc and vanilla, which were superb. Gemma too had a trio of scoops, deciding on toffee, honeycomb and blackcurrent sorbet. I must say the sorbet is one of the best she had ever tasted and worth a visit in its own right. The ice-creams were fantastic too but that sorbet won the night for her for sure! Emma and Peter shared the blackberry and apple crumble, which they felt finished the meal off perfectly. The GrubGang had mixed points of view on the restaurant overall. There was a little matter of a pub quiz which was blaring over the top of our meal out and Dave felt was a little out of place in the restaurant side of things. The carparking is not ideal, and not good for all types of vehicle, but the waiter service was fairly good with the waiter being very patient with our demands! However, the starters did not all arrive within the same times, making some people wait before getting to tuck in! 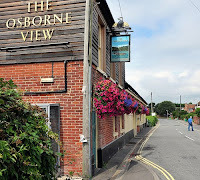 Have been to the Osborne View twice this year, had passed it many times but never been in, so we wanted to visit. Staff very friendly, food excellent. We took our 13 year old grandson and he said how nice the food presentation was.